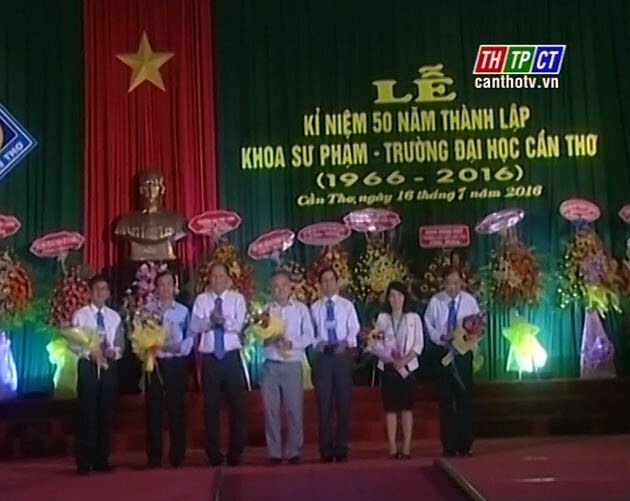 In the morning on July 16th , the pedagogic school of Cần Thơ University solemnly held the 50th Anniversary of construction and development (1966-2016). The pedagogic school is one of 4 first units of Cần Thơ University Institute, now Cần Thơ University, founded on March 31st the 1966. Past 50 years, Cần Thơ Pedagogic School has trained ten thousands of students of regular, cresh course, in-service, association systems by request of provinces, cities in Mekong delta region. Former students of the pedagogic school play not only core roles of teachers staff of high schools, colleges, universities as well as political institutes, but also they become educational managers, contributed importantly in teaching career of Mekong delta, Hồ Chí Minh City and southeast provinces. In the future, the PedagogicSchool of Cần Thơ University will be responsible for training, cultivating prestigious and high quality teachers in Mekong delta region to contribute into career of educational development and socio-economy in nationwide./.